Is this turning into a potato recipes-only blog? Cuz it kinda feels like it. I could absolutely subsist on potatoes (and maybe some bread) for the rest of my life, but things would get a little drab around here. 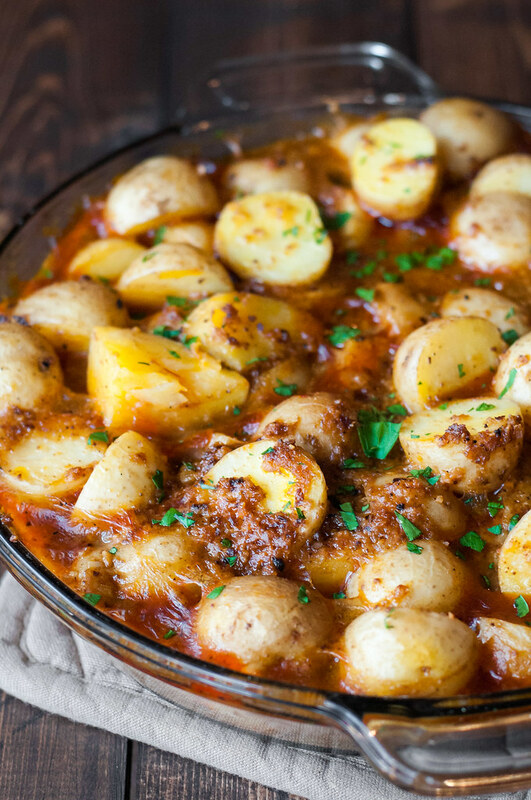 Don’t let the color of this Spanish potatoes dish fool you, though. It’s lively and exciting in every way. Garlic, smoky Spanish paprika, and those mysterious saffron qualities dominate in the flavor department, and a rich puree of quick fried bread and almonds form almost a gravy as they soak up moisture while the potatoes bake nice and slow in the oven. Just when I thought I couldn’t handle another potato gratin. In waltzes this crazy cat. We’re starting to get into non-gratin territory of the gratin chapter in The New Vegetarian Cooking for Everyone (refresher–this is not a sponsored post). If you aren’t sure what I’m talking about, take a look at this post or this list indexing the many gratins I’ve cooked so far. As we venture into Spanish potatoes and enchiladas (definitely not a gratin), I’m keeping an eye out for kohlrabi and other summer veggies to start appearing, so I can return to gratins I had to either skip, or make with shriveled South American kohlrabi. No thank you. In anticipation of my summer CSA subscription, I’ve planned a date for me and Steve to go visit the CSA farm on Saturday. I hear we get to pet little lambs and trudge through the mud, so it’s likely to be a major success. We’re subscribing with The Hickories farm in Ridgefield, Connecticut. It will be my first CSA, and part of what appealed to me about this particular farm (other than their quick responses to my pesky emails) is the involvement they encourage and facilitate by both members and the community. My grandpa still owns his Minnesota farm, but like many in the midwest, it produces massive quantities of just a few crops that probably get shipped around the country. That doesn’t mean he’s not proud of his work, but it’s not so conducive to learning about the operations of a year-round farm with myriad crops and products–everything from homemade marinara to lamb’s wool to maple syrup to eggs. Strangely enough, this summer may bring my first non-cow, non-corn lessons in farming. I finished off the rest of these Spanish potatoes on Sunday, ummm, for breakfast. At least it was healthier than pancakes? I’ll be transforming Saturday’s leftover picnic veggies into a stir fry tonight, then eating my way through some leftover eggplant lentil stew for lunches. And with that, almost all the leftovers in our freezer will be gone! So, for the remaining nights, I’m excited to try Laura’s vegan enchiladas, whip up PW’s pesto and grilled veggie pizza (okay, so I also have pesto and pizza dough in the freezer, but I promise, that’s it), and finish the week out with the next, slightly intimidating gratin. 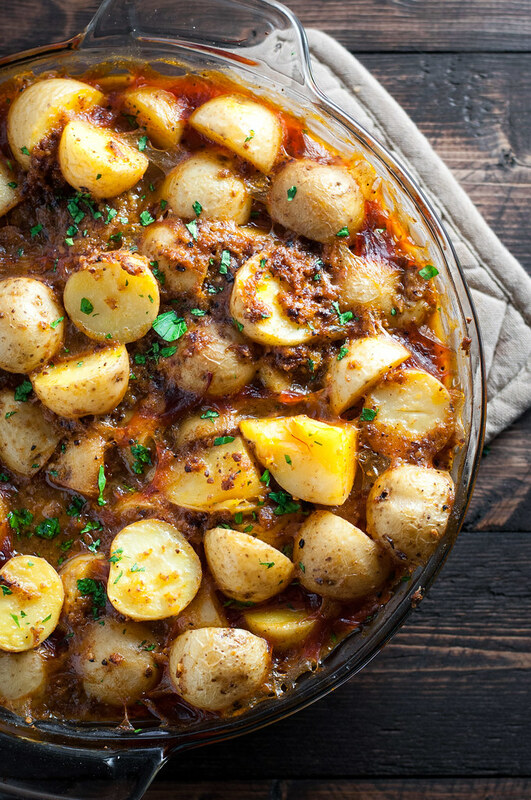 A paste of fried bread, garlic, and almonds binds the potatoes and looks like ground beef. 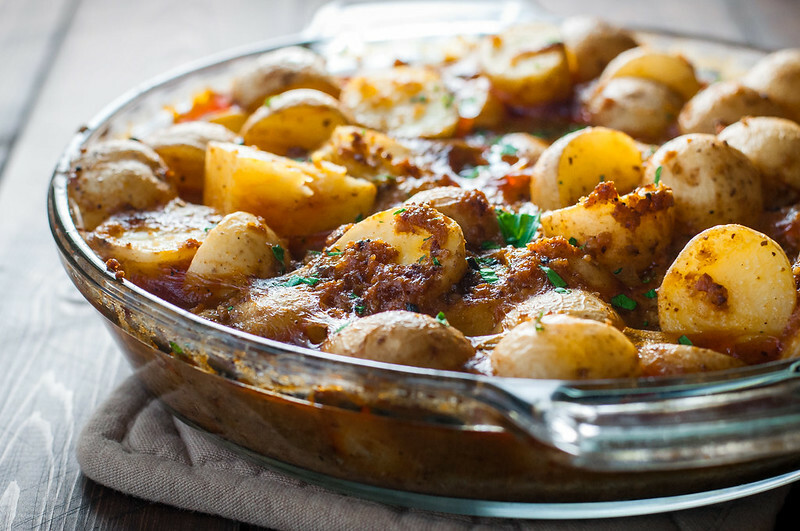 Whether that's good or bad, it lends indisputably scrumptious flavor and lots of hearty texture to this unintentionally vegan potato dish. Adapted from Deborah Madison's The New Vegetarian Cooking for Everyone. Apply a thin coat of olive oil to a 9" glass pie plate (or similar sized baking dish). Spread the potatoes evenly in the dish. 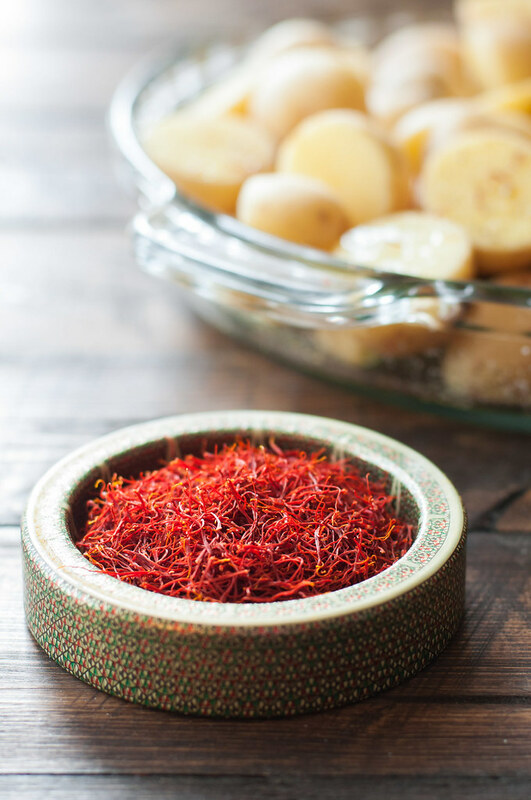 Sprinkle generously with salt, pepper, and saffron, breaking up the longer saffron threads as you do so. Preheat oven to 375 (F). In a small skillet (I used nonstick), heat 1 tablespoon oil over medium until very hot. Add garlic cloves and almonds, and fry for a few minutes (depending on the oil temperature) until golden. Carefully remove to the bowl of a food processor. 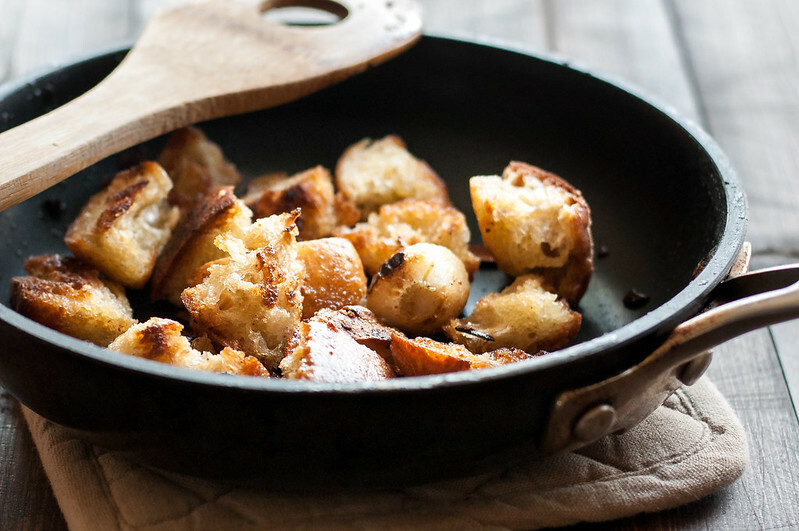 Heat remaining 2 tablespoons oil in the same skillet until very hot, then add bread pieces. Fry, as they sizzle, until they turn golden and begin to crisp. Remove promptly to the food processor. Add paprika, salt, pepper, and a splash of the boiling water to food processor and let cool for a couple minutes with the lid off. Grind until a coarse paste forms, adding more water if very dry. 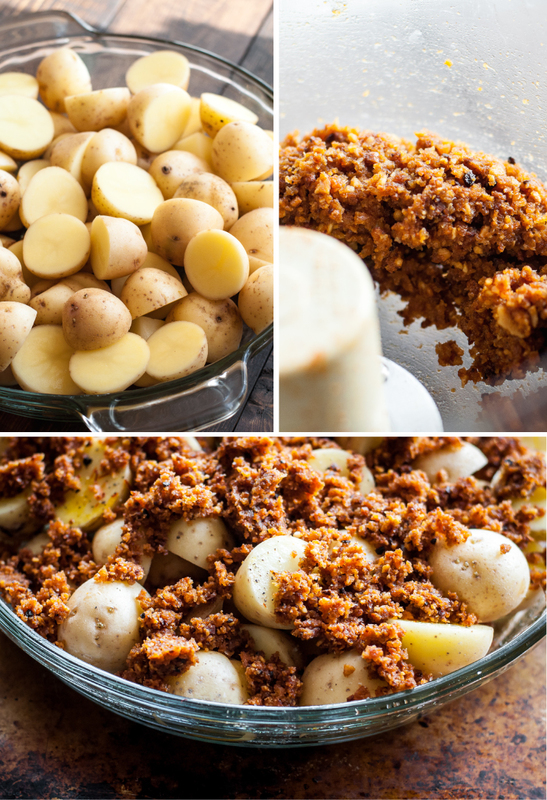 Distribute the bread mixture evenly over the potatoes. Pour remaining boiling water (it's okay if it's slightly cooled) slowly over the potatoes, so the bread mixture isn't disturbed too much. Place on a rimmed baking tray, cover tightly with foil, and bake 45 minutes. Remove from oven and gently stir, now incorporating the bread mixture throughout the dish. Cover again with the foil (loosely is fine) and return to the oven for about 20 minutes, until the potatoes are tender when pierced with the tip of a paring knife. If desired, preheat the broiler and move an oven rack near it, uncover the dish, and broil for a few minutes to further brown and crisp the top. Let stand a few minutes (or more) before serving. The bread will continue to absorb any excess water, forming a gravy-like sauce surrounding the potatoes. For color, top with parsley before serving. To substitute larger potatoes, cut them into 1 to 2 inch uniform pieces. Yes, saffron is spendy. I'd argue that it's worth it, but if you want to leave it out, make sure you're using smoked paprika, not the "regular" variety. If you don't have a tea kettle or small saucepan, boil water in the microwave in a liquid measuring cup. The dish does very well when prepared in advance! Fully cook or cook for the first 45 minutes. Bring the refrigerated dish to room temperature, reheating in a 300 degree oven if previously fully cooked, or finishing as prescribed in the recipe if baked for only the first 45 minutes. Nutrition: the recipe is vegan, as written. Feel free to substitute gluten-free bread to make it gluten-free. As always, if you try it, let me know your results! This sounds fabulous! I love potatoes and bread! what a great combo. Two of my favorite foods :) I combine them anytime I have an excuse to! Yum! This is a tasty, unusual potato dish. I love the idea of fried bread to thicken the sauce. I made these last night for the first time. Saffron wasn’t in my budget so I added a bit extra smoked paprika. They turned out really good, but I would have appreciated measurements for the salt & pepper for the initial seasoning of the potatoes and for the bread/almond mixture. I guessed as best as I could (I’m a pretty experienced home cook), but the dish was quite under-seasoned. Thankfully, it wasn’t hard to fix it at the table. Oh, and I followed your instructions for broiling at the end. The crispy yummy bits were my favorite!! Next time if they have one in your area go to a Latin market I paid $1.50 for 1/8 oz which is more than enough!!!! Can i make it without the bread? Hi Lorraine–you could try it without the bread, but the starch from both the bread and potatoes play a crucial role in thickening the sauce. Gluten free bread might work, though! Have you ever tried Calendula petals ( the “poor man’s saffron”) as a substitute for pricy saffron? I made this recipe last night…it is FANTASTIC…such a treat! Love the fact that it is vegan, it will be a favorite in our house. Thank you for sharing!!!! p.s., I baked potatoes in a black iron skillet. World Market has saffron at a reasonable price. Love this! Could you provide nutritional info please? They only thing missing is a nice glass of wine. I thought it was really tasty, but I didn’t get much sauciness. I had it covered and followed all the steps. Next time I will add more water after the 45 minutes. It did have a really nice crunch though. Thanks for the recipe!